This listing is for MINKY - Natural Luxe Cuddle Luna from Shannon Fabrics . This is the Highest Quality of Minky - never to be confused with the knock-offs sold at the big-box-stores. 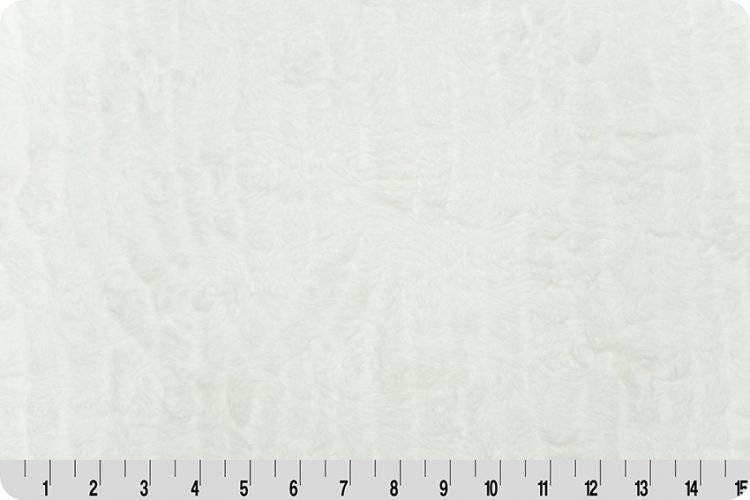 This luxurious Cuddle® minky fabric has an embossed, textured, bunny-soft surface. Suitable for apparel, quilting, baby products, home décor, pet accessories, and more. 1 Yard, 58/60" x 36"
SHIPPING: We charge a flat fee for shipping within the US for all the fabric you order including Minky. INTERNATIONAL CUSTOMERS: Yes, we ship Minky to all of our International Customers but due to the weight and volume of this High Quality Minky, we are not able to estimate International shipping, we need to send you an exact shipping quote. Please convo us the total amount of Minky (and/or other fabrics/notions/kits) and we will send you a shipping quote right away. Thanks! LUNA MINKY ~ just trying a half yard to see how this MINKY is to work with ... Thank You! Outstanding service, fast shipping, great quality! We accept PayPal and Direct Checkout. Fabric ships within 1-2 business days. 1) Fabric must be returned new, unwashed, unmarked, and uncut - in the original condition you received it. 2) Please contact us within 7 days of receiving your package to request our return form and authorization. IMPORTANT: Unauthorized fabric returns will be donated, they will not be refunded, reshipped or credited. Fabric for US returns must be postmarked within 14 calendar (not business) days of receiving your package. 3) Returns that meet condition 1 & 2 above will be offered a shop credit that is valid for 90 days less shipping fees. We do not pay shipping for returned merchandise. If you received Free Shipping on your order, the cost of original shipping will be deducted from your credit, and you will be responsible for paying the return shipping as well. 4) Fabrics returned with prior authorization and in the new, unwashed, unmarked, and uncut original condition will receive a full-value shop credit, less shipping. No restocking fee. If fabric is returned with authorization but AFTER our 14-day return window it will be charged a 25% restocking fee in addition to the shipping fee. Any loss in value due to smell, damage, or pet hair will be communicated when we receive your return and the loss in value will be deducted from any refund processed. PLEASE NOTE: The industry standard when shopping in retail quilt fabric stores is that All Sales are Final. This used to be our policy as well. With the closing of so many local quilt shops across the country and our creative need to see and touch the fabric, we have decided to change our policy so that customers may purchase with confidence - if your fabric arrives and it doesn't meet your expectations you can return it with minimal effort and expense. Above and beyond cutting your order and shipping as quickly as possible, we are here to serve! PLEASE message us with questions or leave notes at checkout if you want specific fabrics to match or coordinate. We provide color matching services (including photos!) quickly and as a free service. Computer monitors vary so we want to help! No question is too big or small, so trust that communication is our priority and know we will respond quickly, 7 days a week. Thank you for choosing to support small business and shop with us! FLAT-RATE SHIPPING: Unlimited US Shipping for $4.95. 2) LOST PACKAGE: All Domestic US & International packages are automatically insured for a value of up to $100. In the rare but unfortunate event your package is lost, we are only able to refund up to the amount of available insurance. In the very rare and unfortunate event your package is lost, please keep us informed so we may be of help and expedite a refund. After 15 days we are able to file an insurance claim. After the insurance claim is filed it takes up to 10 days to receive a refund. We will work with you to quickly complete this entire process so you receive your refund as quickly as possible. In more than 200,000 sales (since we opened CaliQuiltCo) we have only filed 5 claims - again, lost packages are very rare!!! We do not allow cancellations. If you would like to add to your order or change a fabric, please message and we can see if it is still possible to update. 1) INTERNATIONAL SHIPPING: All International orders ship via PRIORITY MAIL or FEDEX EXPRESS ONLY. Priority Mail usually arrives within 10-14 business days. 14 days is not a guarantee, but to date 98% of our International customers have received their fabric within the 14 days. FedEx Express packages usually arrive within 1-2 day to Canada, and 3-5 days for all other International destinations. The international shipping cost includes insurance on your package. 2) MAXIMIZE YOUR PURCHASE: Up to 11 Yards of Cotton Fabric or 5.5 Yards of Flannel Fabric will ship in each Priority Mail Envelope. When purchasing more than 11 Yards we will send you a listing for the additional shipping due. Fabric will not be cut or shipped until the additional shipping fee is paid. 3) REDUCED SHIPPING: After you have successfully received a package via Priority Mail from Stitch Stash Diva, we are happy to ship you smaller orders via First-Class Mail. If you are interested in this service, please message us before your purchase with the number of yards you are purchasing and I will send you a shipping quote prior to your purchase. 4) DUTY/TAXES: All duty/taxes that are added by your country are completely separate from CaliQuiltCo, and are 100% the responsibility of the customer. Please know your country's duty/tax charges PRIOR to purchase. If your order is a gift please leave a note at checkout so we complete your customs form correctly, thank you in advance!!! We do not know what your duty/tax fees will be, and we do not have an option to prepay your duty/tax fees. We do not accept returns nor refund for packages not claimed due to lack of duty/tax fee payments. PLEASE INCLUDE YOUR PHONE NUMBER AT CHECKOUT so we may include this information on your customs documents - this will expedite delivery to you! Many Thanks!!! 5) LOST PACKAGE: International packages are automatically insured for a value of up to $100. Additional insurance is available for a small additional fee and must be purchased before your package ships. Please convo us for specific information and/or an insurance upgrade listing. In the rare but unfortunate event your package is lost, we are only able to refund up to the amount of available insurance. In the very rare and unfortunate event your package is lost, please keep us informed so we may be of help and expedite a refund. After 30 days we are able to file an insurance claim. After the insurance claim is filed it takes up to 10 days to receive a refund. We will work with you to quickly complete this entire process so you receive your refund as quickly as possible. In more than 170,000 sales (since we opened StitchStashDiva) we have only filed 8 claims - again, lost packages are very rare!!! As a small mom-pop business, NO REFUNDS OR REPLACEMENT FABRIC for any lost or wrongly delivered packages with proof that your package has shipped and delivered to the address provided. Fabric is cut "straight" according to the bolt, not the design or print on the fabric. This is standard practice in all quilt shops. When your pattern calls for a specific cut always order a little extra to insure you can place the pattern in the best position. For example, I was sewing my 3 daughter's holiday dresses a couple years ago and ordered a fabric from another shop (as much as I have, there are always more fabrics I need too!) and to save money I ordered exact measurements, planning to move around the three different sizes to make it work. Long story short, my plan didn't work and I ended up having to order an additional piece of fabric, pay additional shipping...I was unhappy! To avoid this scenario always order a little extra! Your pattern calls for 3/4 yard??? Then order a yard. Scraps can be added to your fabric stash, or you can sew a coordinating accessory! Win - Win! Shipping is a Flat Fee of $4.95 for as much as you purchase including Minky and Knit fabrics within the United States. International Customers will automatically be billed for Priority Mail/Express Shipping for up to 11 or 16 yards of cotton fabric depending on your location. To find out how many yards you qualify for, please message us with your city, country, and postal code. Cheaper Shipping for International Customers? We can ship 1st Class Mail for less if you are ordering 5 yards of cotton or less. If you would like to have your order shipped 1st Class Mail, please message us with the title of the fabrics, the fabric cut of each, and your country. We will make you a listing with accurate shipping. How do I order multiple Yards? We always cut fabric over a yard as continuous. If you would like 4 yards for example, please select "Yard" from the Fabric Cut Drop Down Menu and "4" from the quantity drop down menu and it will come as a 4 yard cut. We automatically cut continuous so no need to leave a note. We strive to ship out all orders out Same Day or within 1 Business Day, No Extra charge for this fast turnaround time! We don't always list our total available yardage online. If you are looking for more yardage than what it is showing available, please message with the yardage you are looking for and we will get back to you same day if we are in the shop or next business morning if we are out of the shop. FREE SHIPPING on all US orders of $75 or more (before shipping and sale tax where applicable) automatically. The discount will show up on the checkout page. International Customers will receive a $5.50 discount off of the total cost of shipping on orders over $75 with the code: "INTL550OFF". This discount will be applied before you complete your transaction, and will appear as a fixed $5.50 discount. Coupon codes are to be entered on the Shopping Cart Page. If you order under 3 yards of cotton fabric, your order will ship via 1st class mail. If you prefer Priority Mail / Fedex 2 Day, select this option under Shipping Upgrades on the checkout page.